Efforts to reduce the amount of time aircraft spend in holding stacks before landing at Heathrow Airport are paying off, according to new statistics from air traffic control company, NATS. Since 2014 NATS and Heathrow have been working together to find ways of cutting the amount of time aircraft spend in the stacks, with the latest figures now showing an average reduction of around a minute, equating to a saving of more than 3,000 hours that aircraft spend in the hold each year. Average holding times were about 8.5 minutes at the beginning of 2014, with that figure now just over 7.5 minutes and falling as low as 6.5 minutes in August this year. NATS estimates that the fall in airborne holding has saved over 35,000 tonnes of CO2, the equivalent to more than 11,000 tonnes of fuel, worth £4m at current jet fuel prices. Most passengers who have flown into Heathrow will have experienced their flight circling in one of the four holding stacks around London. The airport needs a ready supply of inbound traffic in order to ensure it makes the best use of its two runways. However, holding is inefficient in terms of fuel burn and emissions. The reduction in holding has been achieved through the use of two new air traffic management tools. Introduced in April 2014, XMAN – or cross-border arrivals management – involves NATS coordinating with its counterparts in France, the Netherlands and Ireland to slow inbound aircraft down from 350 miles away, when delays over London begin to build. As a result aircraft don’t land any later, but do spend less time circling in the holds. A new way of separating arriving aircraft has also made a major contribution. Since March 2015 NATS has separated arriving aircraft into Heathrow by time instead of set distances in an effort to cut delays due to headwinds. Time Based Separation has cut headwind delays by over 50% and by helping to maintain the landing rate has also cut the time aircraft spend holding. 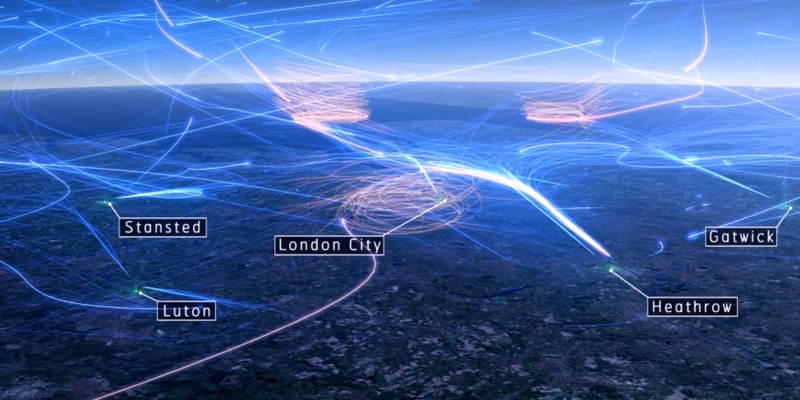 Both changes are part of a wider initiative to modernise the UK’s airspace and air traffic management technologies. Air traffic is forecast to grow by 40% by 2030 and changes to the way UK airspace is structured and used will enable reductions in noise and emissions while improving capacity.